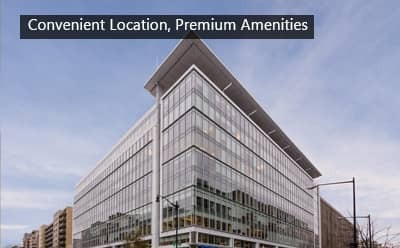 With excellent transit access and a central location, 2101 L Street provides access to premium space right where your clients need you to be. With exclusive gym access, a neighboring day care center, direct access to underground parking, and a rooftop patio available for groups and events, this location provides all the amenities you need. The surrounding area touches on Dupont Circle, Washington Circle, and Farragut Square, and offers a full range of dining options from fast causal to formal table service. Our Downtown location provides access to the best DC has to offer in terms of access, amenities, and high end space, all while giving you the same flexibility and affordability of a shared environment. Our West End center strikes the ideal balance between the charm of Georgetown and the ease of access of Foggy Bottom. Situated between these two areas along the border of Rock Creek Park, our building offers amenities like a green roof, in building parking, and a fitness center, while maintaining proximity to residential areas further West and North. It’s a space that has the look of downtown but the feel of just down the street. Close enough to be convenient for your clients, both Foggy Bottom and Dupont Circle metro stations are a short walk away, while some of the finest hotels in the city surround the block. If you crave a professional office or meeting space that keeps you near the action without feeling overwhelmed by it, the West End is for you. Just on the Washington DC side of Frienship Heights, our Chevy Chase location is ideal for those who need to be located in DC but want to avoid commuting all the way there. 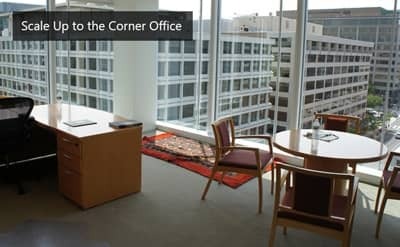 Surrounded by high-end retail locations and complete with interior access to the Friendship Heights metro station, our location is the most convenient way to work. With amenities including an atrium café, an in-building hotel, an outdoor patio, and downstairs access to Brian Voltaggio’s Range, you’d be forgiven for upsetting the work-life balance. 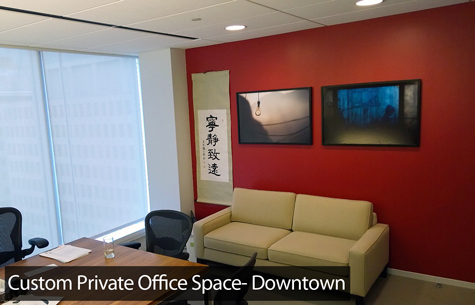 Just because this location is closer to home doesn’t mean it lacks the professional space and services of our closer to downtown centers either, as our newly remodeled location offers more than 10 state of the art conference rooms, location wide wifi, and multiple business lounges for you to get some work in on your way to yoga. Whether you’re looking for a quick rental or a term home, each location offers its own unique feel with its own local benefits. Click below to find out more about what each AdvantEdge location has to offer you!